Million Dollar Password 2009 Edition Game Review - Download and Play Free Version! Sounds and Commentary from Regis Philbin accurately reflect the game. Instructions clearly explain the objective of the game and are helpful for getting started. Solving for the passwords is tricky and forces critical thinking. You never get to give clues, you can only guess the passwords. The computer can often give horrible clues that are misleading. Million Dollar Challenge does not alter at all in game play. Take Part In One Of America's Favorite Game Shows! Participate in some timeless, fast-paced fun as you take part in a battle of wits and a war of words in Million Dollar Password 2009 Edition. Join host Regis Philbin in this update to the classic 1960s game show and compete for that grand prize. Contend with the computer or against a friend as you make your way through six consecutive shows and fight to win every round. Feel like you're part of the action as you experience graphics taken directly from those elements found in the show and authentic audio cues with voice quotes from the live performance. If you are unfamiliar with how the game show works, contestants are paired with celebrities and one member of the pair is given a special word, the password. They then try and get the other member to say the word out loud based on clues which cannot be more than one word, or a hyphenated word, nor can the clues contain part of the actual password, such as saying "light" if the password is "flashlight". After two rounds and trying to guess five passwords, the contestants swap celebrities to keep things fair. Whoever has the most correct passwords after four total rounds heads to the bonus round and gets a chance to win up to a million dollars. 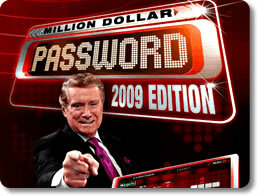 Million Dollar Password 2009 Edition provides plenty of hours of brain-teasing fun. Compete against the computer or add to the tension and grab a friend to play, one after the other, and see who can guess the most passwords. Test your vocabulary and flex some of that mental muscle as you try to discern the correct words. If you want a break from all the word guessing, there are bonus mini-games which appear throughout the episodes which can be completed for extra time during the next rounds. They are creative implementations on the Password theme, such as a crossword-style game where you put answers to clues into a grid or you are given a clue and you have to find the password within a word-search puzzle. So if you are a fan of the game show or just like word association games, download Million Dollar Password 2009 Edition today! Million Dollar Password is a word guessing game show that has you guessing an unknown password, using clues given to you from a “celebrity” partner (not actual celebrities). 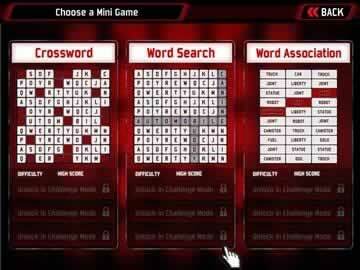 The game offers several modes of play like crossword and word search mini-games, along with the chance to win 1 Million Dollars. Solving the puzzles can be tricky, but if you and your celebrity partner can get on the same page, the million dollar prize is only six rounds away. The controls of the game are relatively simple and consistent throughout all modes of play. 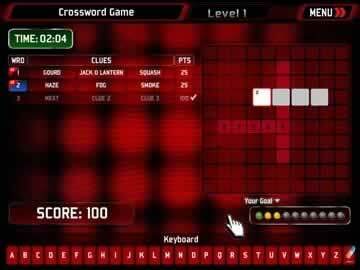 Clues appear on the top right side of the game display and you use the keyboard to type in guesses to the clues. Once a guess is entered you use the ENTER key to submit your response. If you are unsure of an answer you can click the SPACEBAR to skip the clue and proceed to the next. The mouse can also be used to type answers. You must simply click on the letters and then click SUBMIT or PASS. Pass the Elimination Round or No Big Bucks For You! An Elimination Round starts the game. You are paired with a celebrity guest and the two of you compete against a computer player to uncover more total passwords. The elimination round is four rounds long, and the maximum number of passwords you can uncover is 20 total. After two rounds of five you and the computer celebrities switch positions to keep things fair. The contestants with the highest score at the end of the four rounds win the game and advance to the Million Dollar Round. In the case of a tie one password is randomly chosen and the contestants alternate clues/guesses until the correct word is guessed. The Million Dollar Round is a 6 level pyramid of increasing rewards. You start at the bottom, playing for only $10,000 and work your way up the ladder for a chance to win $1,000,000. The rules of this game are slightly different than in the Elimination Round, however, the game play and objectives are nearly identical. You are still paired with a celebrity in this round, however, only three clues are allowed per password. Since you only have three chances your guesses must be well thought-out and accurate. If you pass on a password, it is gone and you will not be able to return to it later. As you advance the passwords increase in difficulty. Before the start of each round you are given an option to walk away from the game or continue playing. If you play and lose, all of your earnings are lost as well. However, the second and fifth rounds are safe havens that guarantee you the money of at least those levels. The Million Dollar Round is a nerve-racking risk that can payoff tenfold, or leave you broke wishing you'd walked away earlier. Other features of this game are mini-games that add variety to the game and keep things interesting. You can play a Word Search, Word Association game, and Crossword game in this Million Dollar game show. In the word search you must find the passwords hidden in the maze of letters by utilizing the clues given. For each password there are a maximum of three clues, but only one is revealed initially. Word association has you matching two related passwords from neighboring rows . Bonuses exist in this game to keep things interesting. The crossword puzzle is also a password game that has you typing passwords on the crossword board by utilizing the clues given. Like with the word search there are a maximum of three clues, but only one is revealed initially. The sounds and the graphics of this game are great. The inclusion of Regis Philbin adds to the realism and increases the playability. Despite this, there are a few downsides of the game that are inescapable, the greatest being your inability to give clues. Throughout the game you only get to guess the passwords. It would be a nice element to be able to give clues too. Also, the clues given by the celebrities can often be misleading and downright awful. They often seem completely unrelated to the subject at hand and pointless. Improvements of both giving and getting clues would make this a much better game. All in all Million Dollar Password is a fun game that does a lot of things right. If you are a fan of the televised game show, or just a fan of Regis Philbin's commentary, you'll love this game. It can be complex and it will challenge and cause you to think critically. Though the clues can often be misleading and hard to figure out, this game hits on a lot of positive areas. Any fan of password or clue based games will love this. The advanced nature may make it too hard for younger users, however, all should give it a try and play. See a few gameplay highlights in these short clips featuring some of the mini-games and word association fun found in Million Dollar Password 2009 Edition.